In 2009 we did our first small Shoebox collection and took them to Romania to our partner church and gave them out to the poor Gypsy communities. Thanks to the generosity of churches and schools, in the eight years we collected over 16,000 shoeboxes from around the UK and delivered them to families living in poverty in Romania. To most of us a shoebox does not seem very important – the contents are nice but usually we do not see these as spectacular. Yet to the people who receive these they are precious beyond our comprehension – particularly because they show them that someone has thought of them. Our shoeboxes are not just for children. 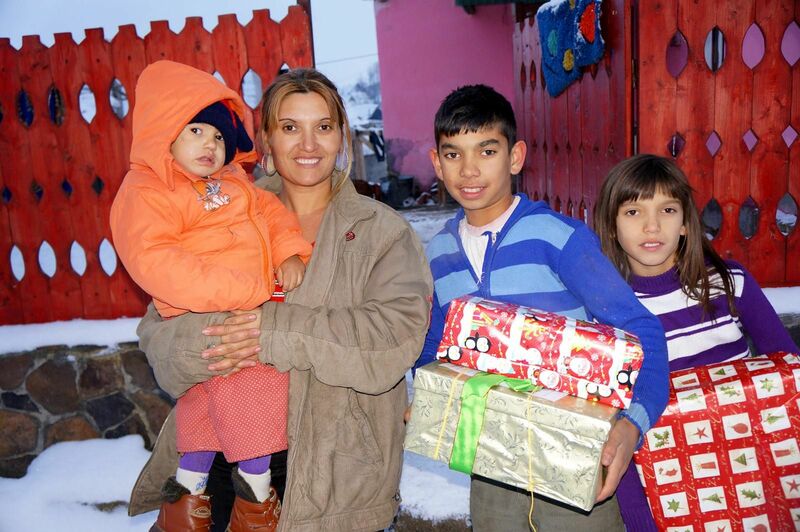 At the request of our partner church in Romania we also encourage supporters to put items in the shoebox which will be gifts for parents and grandparents. This often opens doors to follow up visits by church members. Click here for the Shoebox leaflet, one of which needs to be attached to each shoebox. Please note that we send you a set of printed leaflets when your group enrols in the schem. Click on the picture below to watch the 2018 Shoebox promotional video. If you or your school or church or other organisation wish to get involved then you need to contact us to register an interest and we will then send you a pack of printed shoebox leaflets, an organiser’s information sheet, and a shoebox DVD. We regret that we will be unable to collect individual shoeboxes and you do need to be part of a group. Please contact janet@amentrust.co.uk for more information or to register your interest.